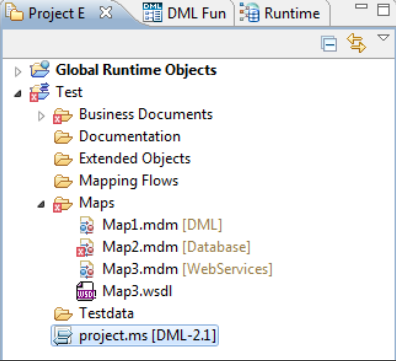 DML Map: The DML Map uses DML expressions to transform and map one or more input Business Documents to an output Business Document (see Create a DML Map). Database Map: A Database Map is used to map data to or from a database (see Create Database Maps). Web Service Map: A Web Service Map is used to call a Web Service that contains the input message (see Create Web Service Maps). SAP Map: The SAP Map is used to map data between SAP metadata objects and other types of data structures (see Create SAP Maps). You can identify the Map type (DML, Database, Web Services, or SAP) in the Navigation view as shown in the following graphic.